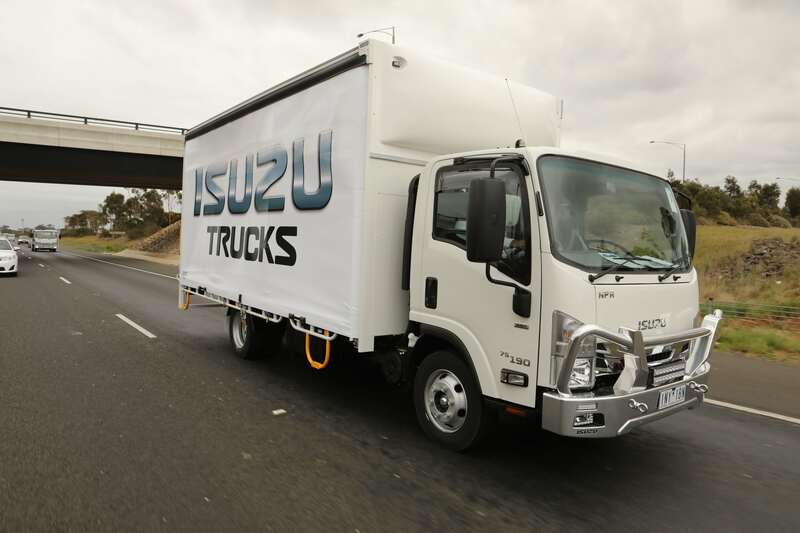 Isuzu has given the trade press a briefing and the chance to drive the latest updates to its market leading N series range at an event in Melbourne this week. Isuzu has introduced a number of running changes to the popular light /medium range including independent front suspension in some of the smaller NNR versions as well as the inclusion of its own AMT in its off-road NPS 4×4 variants. Along with those changes there have been some running updates to its fluid coupling equipped AMT including more intuitive and predictive shifting, while a new multimedia system has enhanced the cockpit experience. As Isuzu zeroes in on its 30 straight years of market leadership its clear that ongoing evolution and ongoing improvements are the reason why it has been able to pull ahead of the opposition and command almost a quarter of new truck sales in Australia. Behind the wheel of the NNL with the new IFS system and rack and pinion steering in place the ride and handling were a major step up from the often choppy and uncomfortable ride delivered by the old-style I-beam front axle and suspension. The steering is precise and well weighted and makes the truck very easy to drive. This is a perhaps a predictor of things to come and we can see the IFS eventually spreading further across the range as demand gathers. On some choppy roads around Melbourne’s western suburban outskirts the IFS was smooth, controlled and very comfortable particularly by comparison with the old-style system. The Isuzu AMT seems to get better every time and is now much more decisive and proactive particularly in situations approaching roundabouts and intersections where the ability for the driver to quickly accelerate into traffic without waiting for the box to belatedly figure out what gear it needs is critical for smooth and safe operation. The latest spec is able to do just that and is a delight to drive. Off road we had the chance to drive a variety of NPS variants on a steep and challenging course in the Lerderderg Forest and the two pedal AMT showed it will be a strong contender for fire services, mining companies, farmers and off-road adventurers. The smoothness of the power delivery with the AMT was impressive and its climbing and descending performance was faultless. 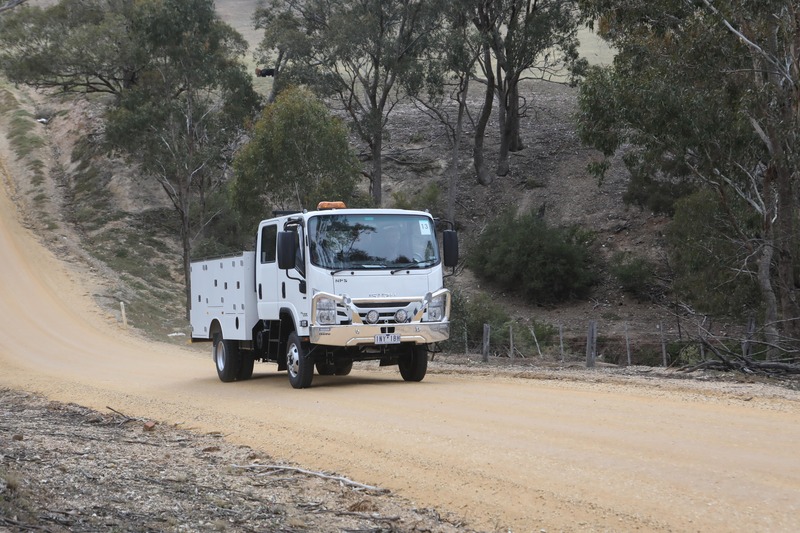 Isuzu claims it’s the first ever two-pedal AMT equipped 4×4 light truck available as a factory fit on the Australian market. The company claims that the five-speed AMT has been calibrated specifically for and exhaustively tested in Australian off-road conditions and climate to measure up to the expectations of local customers. The newly promoted COO of Isuzu, Andrew Harbison said the 2018 N Series range provides more of what Australian truck customers are looking for. “We strive to provide our customers with a choice of products closely suited to and aligned with their business needs,” said Harbison. Isuzu’s knowledgeable and always approachable chief engineer Simon Humphries told us that the company invested a lot of time and effort into developing the two-pedal 4×4 AMT package from the ground up. “The result is a superior product for all operators looking for a 4×4 light truck that’s easier than ever to drive,” said Humphries and having driven it we would have to agree. The NPS 4×4 uses a high-torque 5.2 litre 4HK1 engine with155 hp at 2,600 rpm and 419 Nm of torque between 1,600 and 2,600 rpm and boasts a GVM of 4.5 tonnes making it legal on a car licence, a huge advantage to organisations like volunteer rural fire services. In terms of the suspension and steering upgrades Humphries was particularly proud and eager to sing the praises of the upgrades. “With most of the NNR line-up we’ve moved away from the more rigid leaf- sprung solid axle set-up to the independent coil sprung assembly,” said Humphries. “This improves ride quality and handling while still being able to support a decent payload and is coupled to the new rack-and-pinion power steering delivering sharper response and a more enjoyable driving experience,” he added. Humphries was also eager to spruik the improvements to the cab interior particularly the upgraded multimedia system. The new system uses a 6.2-inch touch screen with improved brightness and resolution and operates on the Android Automotive operating system. It has USB 3.0 connectivity, V4 Bluetooth connectivity as well as AM/ FM/ DAB+ and internet radio capability through a connected smartphone using Wi-Fi. At the end of the day Isuzu has done a cracking job on the N series upgrade and we came away impressed with its performance and refinement and will continue to give light duty buyers a strong reason to buy.